KELOMAT’s CeraMic Induction pancake pan is a must-have for all pancake and crepe lovers, not only because of its shape, but also because of its colour. The pan has a diameter of 25 cm and a low rim that is levelled on one side, which makes turning the pancakes in mid-air (flipping) and taking them out of the pan extremely easy. 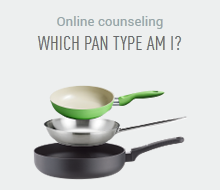 The pan can also be used on modern induction stoves. Optically, it is a real gem in every kitchen as well with its red KELOMAT Color special coating and its cream-coloured ceramic non-stick sealing on the inside – heat-resistant up to 400 °C. There will be nothing left to wish for functionally as well: the pan heats extremely quickly and is ready for use in a heartbeat (you can turn the heat down quickly afterwards). The ceramic coating prevents sticking of the dough and guarantees easy flipping. Since the rim is levelled on one side, flipping pancakes with a spatula or in the air is extremely easy, even for amateurs. The ceramic sealing is robust. However, scratching and/or sharp objects should not be used on it. We recommend our synthetic kitchen aids. 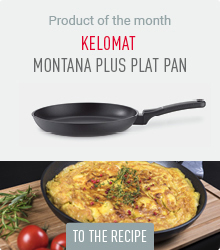 The pancake pan is one of six pans of the KELOMAT CeraMic induction series.